I always look forward to opening up the mailbox. Sure, email is great - but there's something magical and mysterious about having physical, tangible items delivered to you from somewhere beyond. The other day was no exception, as I happened to receive the latest issue of Dog Fancy magazine (November 2011). 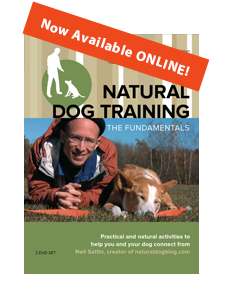 And in the "Natural Dog" section is a feature on Natural Dog Training, including interviews with me and Kevin Behan, along with a couple people who have had some very positive experiences with NDT. (Cliff Abrams and Sang Koh). 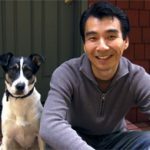 The article is entitled "Push Away Stress" - and I think it does a great job of zeroing in on one of the central principles in how we interact with our dogs - that the key to establishing a rock-solid connection with your dog is to recognize that life for your dog, especially in a human world, creates stress. Your mission (should you choose to accept it) is to give your dog ways to relax that tap into their innate mechanisms for releasing stress. By doing so, you are teaching your dog that no matter how the world makes them feel, you are uniquely capable of helping them get through it. This might all sound a little mumbo-jumbo-y, but I've seen it now time and time again, how tapping into your dog's primal circuitry changes things for the better. My DVD set (and this website, and Kevin's books, and Lee Charles Kelley's articles, and…) gives plenty of examples of how once you're plugged in with your dog you can turn that relationship into enthusiastic "obedience." Note that the reason that I put the word "obedience" in quotes is because the concept becomes almost moot. Your dog doesn't "obey" you - because there's no need. What happens is that you learn how to communicate with your dog in a language that they understand. So your dog listens, and responds. Not because they are suddenly blindly obeying you, or because you've become the "authority" in their lives - but because they care what you have to say. It makes sense to them. Even more, it FEELS good to act in harmony with your desires. Because now you both want the same thing. 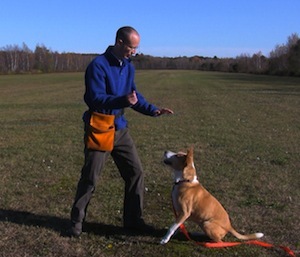 If reading the Dog Fancy article is your introduction to Natural Dog Training, welcome! I'm sure you're intrigued to know what "pushing" is all about - as the technique was essentially the focus of the article, without any detailed instruction on how to actually do it! 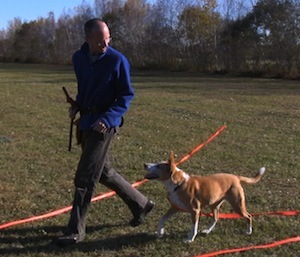 As you might expect, I do explain thoroughly how to do it on my DVDs - but I also provide written instruction here on my website on How to Push with Your Dog (and the follow-up - Why to Push with Your Dog). Thank you to Dog Fancy magazine (and writer Susan Chaney) for an open-minded article about what we do. And thanks, once again, to all of you. It's your attention, questions, and feedback (yes, keep sending emails with your stories of your success!) that help remind me why I'm doing this in the first place.